I had long been looking forward to coming back to Cotton. On my first tour of the churches of Suffolk ten years ago, it had been one of my favourites of the 550-odd churches I'd visited. I cycled out this way in the bitter february of 2009, breathless with the cold as much and with anticipation. But the church was locked, something I had not found ten years ago. There was a keyholder notice, but it was a telephone number, and there was no answer. It took me two more visits before I found someone in, which is a great shame, because this is a smashing church, full of delights, and yet little known. It is probably the best building of the Decorated period in all Suffolk. Cotton is a scattered village ajoining the larger Bacton, with which it is in a joint benefice. The roads twist and turn around the sheltered churchyard; it is a lush, secret place. The building seems relaxed, and slightly battered, compared with the rigours of Perpendicular to be found around and about. There are two niches in the east wall, facing the road, their crowning turrets rising either side of the gorgeous tracery. The building unfolds as you approach the south porch. The bumpy, verdant graveyard is a cushioned setting for this jewel. The Decorated windows of the aisles, with their reticulated tracery, are all slightly different. Above them towers the Perpendicular clerestory, its windows picked out in brick. Typical for Suffolk; but, on this occasion, taking a back seat. The porch itself also has two little turrets, and decorated tracery in the walls. Marian imagery decorates the outside, as well as some rather odd (and unfinished) Victorian patterns. They seem intended to echo the 15th century flintwork patterns in the clerestory. The porch contains one of the county's best 14th century doorways. The arch consists of sets of three fluted columns, supporting elegant lines and fleurons, retaining much of their original paint. The door looks as if it might be original. The porch also contains a stoup, which looks like a mortar set in the wall, but may also be original. Before going in, however, walk around to the west side of the tower for a rather startling surprise. A great archway is cut in the wall, towering about thirty feet above the ground and enclosed by a wrought iron screen. It contains the bell-ringers' chamber, as well as a bier, and a rather precarious ladder to the belfry. Above the arch, three large niches may have contained a rood group. The tower is a chunky 15th century affair, buttressed only in the lower stages. large Decorated bell windows open beneath grotesques, although it is a shame about the louvres in them. This tower was built to stand against this nave; notice the decorated west window in the interior wall of the archway. From within the church, it appears that there is no tower. The graveyard at the west end is rich with bracken, angelica and primroses. It is very beautiful. In recent years, a simple circle of ground has been set aside for the interment of ashes. This is not always done well in churchyards, but here there is a lovely headstone inscribed remember the people of Cotton whose ashes lie here at the top of the circle, and a line of shingle which enfolds the inner ground. Suffolk Perpendicular has a way of looking younger than it actually is. Decorated reveals its age rather more easily, and as you return to the church and step inside, you enter a seemingly ancient space. The stark white walls and arcades rise up into the shadows, surmounted by one of Suffolk's most beautiful double-hammerbeam roofs. The arcade to the north aisle in particular leans out most alarmingly. The roof is a beautiful golden oak colour. It was built in the 15th century, at the same time as the clerestory. 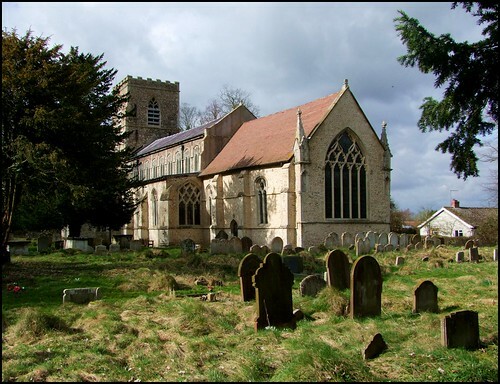 Bequests expert Simon Cotton tells me that a Thomas Cook, in his will of 1471, left a close called Garlekis towards the reparation and edification of the new roof of Cotton church. And so, here it is. The most easterly bay is panelled, to form a canopy of honour to the rood. None of the rood apparatus survives, but not only can you see how it cut into the chancel arch, the cutting away of tracery beneath the most easterly clerestory windows shows where the rood loft stood, and how big it was. The stairs come in from the chancel, and would have turned outside the chancel arch into the loft. It must have been a magnificent sight before the protestant vandals of the 1540s destroyed it. In the chancel itself, a beautiful set of sedilia and piscina are crowned with decorated canopies, the middle two missing. The more you explore, the more you discover, and the more you sense what a significant building this is. Take, for example, the tomb recess in the north aisle. It is now cropped by the modern pews. The church guide suggests that it was not an Easter sepulchre, and yet, I think that it might have been, and I remain to be convinced that only tombs in the north wall of the chancel were used for this purpose. The 17th century pulpit is a beautiful colour, unstained and golden. An alarming creature acts as a handhold; a griffin, perhaps. The font is reddish, like that at Nettlestead, and there are some jolly monks and priests around the shaft; but they may have been recut.A scattering of medieval glass adds a frisson of colour to the clerestory windows. Otherwise, all is stark white and wood. This whole building is, I think, one of the most beautiful art objects in the county; it deserves to be so much better known than it is.